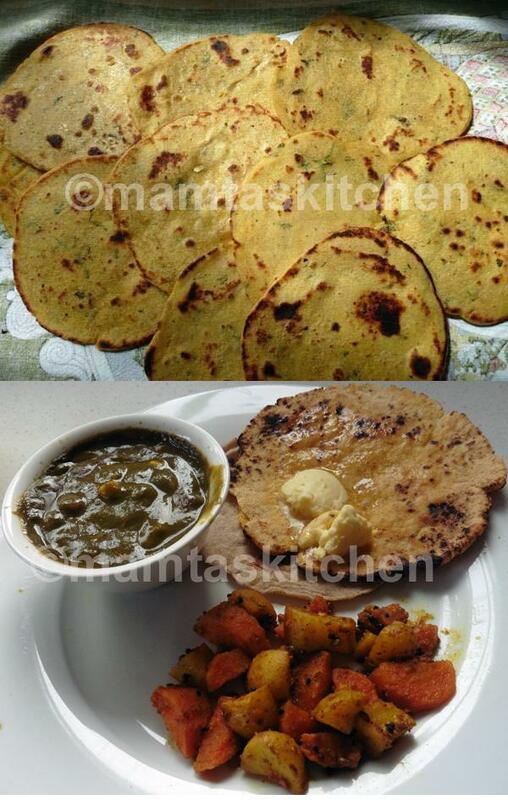 Makka roti and Sarson ke Saag (green Mustard leaves curry) are a popular winter combination in many North Indian homes. Makka roti can also be served with saags ) other than sarson/mustard. The word saag simply means green leaves cooked in a curry style (not exactly like curry). A glass of cold Sweet Lassi, or Namkeen Lassi go well with it are usually served with it. 2 cups medium ground corn flour/cornmeal (makka atta), not the fine corn starch for making custard. Ask for makka atta for roti at Indian grocers. 1 plastic food bag, cut open on 3 sides, leaving one side intact. Optional additions to the dough; you can add any of these to the dough, finely chopped onions, chillies, dry methi leaves, chopped coriander leaves, chopped sun-dried tomatoes. Place cornmeal flours or makka roti atta in a heat resistant bowl. Add boiling water, mix with a spatula or fork and leave until cool enough to handle. Knead a little to make a soft to firm dough; firm enough to roll out, but not too hard. Hard dough will make hard rotis. Leave it aside for 30 minutes or so, then knead again to get a soft, smooth dough. Start heating the tava/griddle to medium hot. These are thick roties, so should cook slowly to make sure even cooking. Divide dough into 8-10 portions. Roll one portion into a ball and oil it a little. Rolling out, method 1; Corn dough is sticky and rolling it between two layers of oiled plastic makes rolling out easier. Open the plastic bag layers and spread a thin film of oil on both inner surfaces. Place the oiled dough ball on the centre of the bottom layer of plastic bag. Cover with the 2nd layer of plastic bag. Roll it out through the plastic by pressing it gently in a circular motion with your fingers, approximate circle of 10-12 cm. No rolling pin is generally required. The roti should not be too thin, roughly 1/2 to 3/4 mm. Lift the whole bag and place it gently on your left palm, with roti in it. Peel the top plastic sheet off gently. Transfer it over to the other oiled palm, bottom plastic now on top. Gently (it breaks easily) peel the 2nd layer of plastic off. Transfer the roti gently onto the pre-heated tava/griddle. Make a dough ball with unoiled, dry hands, rolling it into dry cornflour to stop it from sticking. Roll it out gently, dipping it in dry flour from time to time. Aplly very little pressure, or it will stick to the base. Lift it off with a wide spatula and gently slide it onto a heated tava or friddle. Cooking ; after a minute or two, turn over gently using a wide spatula. While it is cooking, you can roll out the next roti. Turn it over once again. Both sides should have a few brown spots on it. Continue cooking by turning it over from time to time, until it becomes brown in many place (see picture). You can finish cooking it directly on a flame, using tongs, turning frequently, until crisp and cooked. I usually half cook them on tava/griddle and then finish them off under a hot grill just before serving. Makka roti takes longer to cook than a wheat roti. Serve immediately, smeared with a little butter or ghee, with Sarson ka Sag or Sarson ka Saag and Turnips or Palak Paneer. If you need to cook rotis in advance, cook until step 15 and keep wrapped in aluminium foil or in an air tight roti container. When ready to serve, heat a grill to maximum and cook on both sides, 3-4 rotis at a time. You can add chopped coriander leaves/a handful of fresh methi leaves/1 tbsp. dry methi leaves/very finely chopped green chillies/onions to the dough, along with a little salt. This dough can be made into either rotis or parathas. Shallow fry it to make parathas. If you have difficulty in rolling out corn meal rotis, add 2-3 tbsp. chapatti flout to it. I sometimes add 1/3 cup of mashed potato to the dough to give it a softer texture.